Wednesday 13 is a busy man. Starting at the age of just 16, he has spent twenty years in the music industry, releasing 17 full length albums from six different projects, including Murderdolls with Slipknot's Joey Jordison and his own solo material. 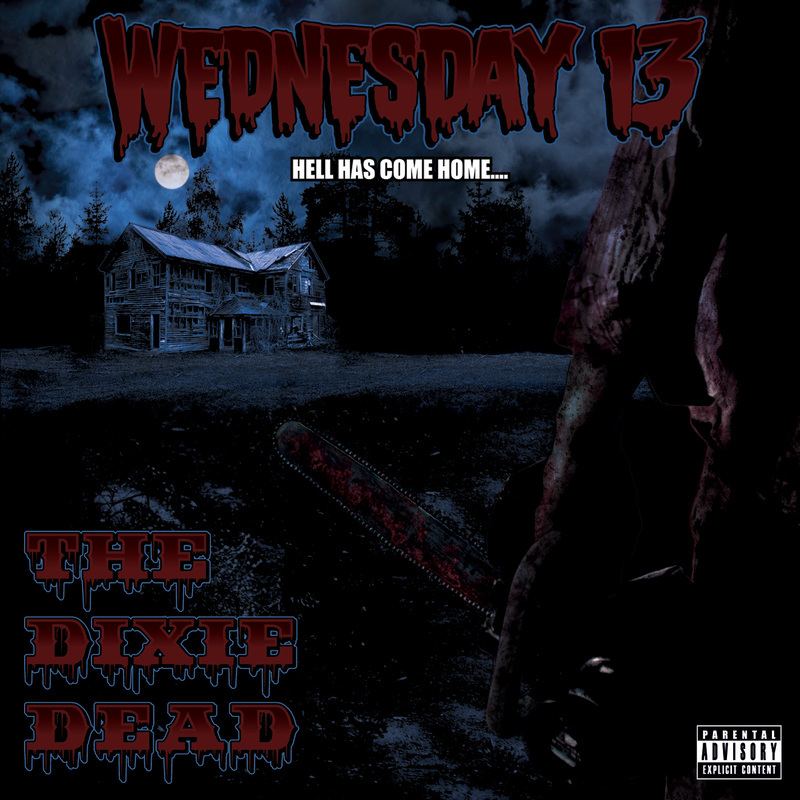 This February sees the release of the brand new solo album The Dixie Dead, a release that reminds Wednesday of his first solo CD, 2005’s Transylvania 90210. In a rare break from writing, recording and touring, Wednesday spoke to Caught in the Mosh about the new album, filming his first ever horror movie and being stranded in tsunami ravaged Japan. Ten years as Wednesday 13, twenty years releasing music. This is your year! Wednesday 2013... A nice way to celebrate your anniversary! The Dixie Dead is out in a few weeks. I hear you regard it as your favourite CD after your first. Why? What’s different about this CD? The new track Curse of the Living is awesome. It has a chunkier, heavier feel to it compared to Calling All Corpses. Was that a conscious decision or just the way things went? Thanks! Yeah, I knew it was kind of going that way. I tried to explain it to people. I can look back on it and I can see it, but they didn’t see it at the time. I kept myself so busy. I go from... or at least that’s how it was, with the Murderdolls project, which was a whirlwind of just... everything. Of touring and things like that. After Murderdolls, I went straight back into recording a new Wednesday 13 record, so there was really no gap between them. So when I started writing Calling All Corpses, I had to rethink what Wednesday 13 was about. I thought, oh, when I first started writing music, what was I listening to? I listened to the Ramones and more kind of punk styles. So Calling All Corpses came across as a more a simple kind of rock record. I wasn’t trying to make a heavy album. But when it came close to write the Dixie Dead, I was listening to heavier music. I’ve always favoured heavier guitar riffs. I’m a big fan of White Zombie, Pantera, Slayer and even Metallica. Just cool riffs. Now that I’m not playing guitar, whenever I write riffs, I don’t dumb it down so I can play it, perform it. I have a really awesome band behind me now, I believe. So this records showcases the life that I have right now. I want to do something outside my comfort zone. Write a record that’s got riffs. Heavy, chunky riffs and stuff that isn’t what people would normally expect from me. But I feel it catches the Wednesday 13 vibe. We’re not changing that. You’ve had the same core group of musicians in your band for number of years now. How does the length of time you’ve spent together affect your writing and live performances? You’ve been involved in six musical projects in your twenty years. What drives you to seek out new projects? Well, that’s the thing. As of now, I’m really focused on Wednesday 13. So, as far as doing anything else, as far as doing another project or activating an old one any time soon, I don’t really have any.... Nothing’s inspiring me to do that right now. The reasons I did the other projects? Well, the Bourbon Crow country thing was inspired by hanging out with an old friend after shows, drinking, listening to old outlaw country music. We said hey, we should sit down and write our own country record. That’s how that one happened. And Gunfire 76 came about because at that time I was bored with the Wednesday stuff. I wanted a break from it, so I tried something new. So that’s how some of those other projects came about. I wanted to do something different without ruining the Wednesday name. I didn’t want to bring country music into Wednesday 13 and confuse my fans. So that’s where the side projects come in handy; when there’s a side of me that I know I can’t get out with the Wednesday 13 stuff. But also again, it was out of boredom. I needed something else to do and it was lucky that I could do another thing. The Gunfire thing, even though it was short lived, and not many people got to see it and to hear it, it was like a training ground for me, because I had to get back to basics. I wasn’t hiding behind makeup, I wasn’t hiding behind my guitar. I had to go out and be a front man. And my songs weren’t about stupid horror movies. So it was like I had to give away all my... I had to come out of my shell, so to speak, and learn how to be a front man. So that’s what the Gunfire band and record did for me. It got me out of my shell. It got me out of my comfort zone. Now I feel that I’m a better front man because of it. But who knows what I’ll have down the road. There could be another project that could inspire me to do something else in the next decade of my life. Well, I hear you already have another project up your sleeve. Can you give us any details about that? Yeah! Hopefully I’m filming my first ever horror movie! It’s story I’ve been working on, which is actually the story of the Dixie Dead, where the title the Dixie Dead record came from. If you listen to that song when the record comes out, it kind of paints a picture of what the movie’s story is about. It’s basically a southern fried hillbilly zombie movie. With my sense of humour and my vision. That’s something I’m planning on working on. I’ve been asked about doing horror movies ever since Rob Zombie started doing stuff. People have been asking, “Hey, when are you going to do something like that?”. And I’m like, ah, I don’t know, I don’t know... So it’s been ten years now that people have been asking me that and I thought, why couldn’t I do that? I’m definitely influenced by it. I’ve been writing songs about horror movies my whole career. And plus, I have the eye for doing horror movies. I’ve always wanted to do one, ever since I was a little kid, so, now that I have an audience that want to see it, now seems like the perfect time to do it. It’s funny; I was watching Weirdo-A-Go-Go recently and wondered whether you might make a horror movie some day! Speaking of Weirdo-A-Go-Go, do you have any plans for Version 2? We’ve definitely had ideas on what the next one would be like. There’s always “oh, one day when we do that”. When will it happen? I don’t know. There are so many other projects that I want to do before I do another Weirdo-A-Go-Go dvd. I want to get the Wednesday 13 live DVD out, with the backstage stuff showing me interacting with the fans. That’s what our fans want to see, for the most part, not some stupid video on Youtube. I want to put more of that stuff out before I put out another Weirdo-A-Go-Go. I’m sure there’ll be another Weirdo-A-Go-Go and it’ll get a remake and there’ll be a full movie... Again, I’ve built this crazy resume of things I’m known for. I’m the horror punk guy, I’m the weirdo guy that releases a dvd where they’re playing with puppets and hosting horror movies and then I have a country band (laughs). You know what I mean? So I’ve kind of taken my self all over the place. But it’s why I have such a unique fan base and unique fans. And that’s what separates me from the herd. From the pack. And I like being me. Back in 2011, you donated a portion of the proceeds from Re-Animated to the Red Cross. What bought that about? We had been involved in the earthquake and tsunami in Japan. We got stuck there. The airports were closed for three days. We were in a foreign country, with no idea of what was going on. Everyone was telling us we’re going to die from radiation or water coming in at any moment, so we were terrified. I already had Re-Animated in the works and knew when it was coming out, so when I got out of there so we used some of the proceeds to go towards the Red Cross, because I was in all of that. I saw the people panicking. I was at the airport, stranded with people. So it was something that was close to me. And you know, it wasn’t like I really gave anything that even made a dent, but it was something that helped and something that was close to my heart and something that I wanted to do. Is any of the money from your current eBay auctions going to any charities? No, not this time. You know, a lot of people say, “I can’t believe he’s selling his hat” or this or that. Most of that stuff I put up... I don’t have a giant house any more. I moved to California and I have a much more reasonable sized place for my stuff and I just don’t collect everything. I have prop after prop and box after box of stuff. This isn't like the Hard Rock Café. I can’t put it up in my house. I don’t need to do that. I can give this back to my fans. I can put the money back into the shows. When I sell this stuff I can buy a new backdrop or this and that. We kind of just clean out the warehouse to make room for new stuff. Plus fans can get a chance to own a part of what they saw on tour and that’s a cool thing for them. Record label licensing disputes stopped Trent Reznor filming his 2008 tour. Your various projects have been released on numerous labels over the years. Do you have difficulty keeping track of your work? You’ve played with Alice Cooper and Marilyn Manson amongst others. It must be a buzz playing with your idols. Who would you want to play with that you haven’t already? Kiss and Twisted Sister! That would complete the list after the other two. And the Killing Joke is on my list too. Well, that’s time. Thanks for taking the time to talk to us Wednesday. When you come back to Australia, please play Perth and Adelaide! Not a problem. Thank you. And yes, Perth and Adelaide are definitely part of the plan for next time. 2013 is the year of 13! The Dixie Dead is out February 22nd on 3Wise Records.